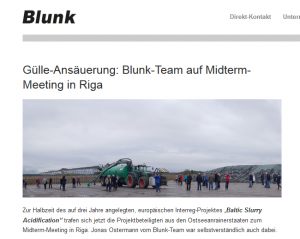 Baltic Slurry Acidification project partnership and invited stakeholders received a full update on project proceedings during the Stakeholder Meeting in Riga, 11th of October, 2017. The stakeholder day was a part of the project’s four day long mid-term meeting and included a field trip to see Latvian in-field pilot investment at Lauku Agro. The stakeholder day started with an introduction to slurry acidification as a process and to Baltic Slurry Acidification as a project. The main aim is to reduce nitrogen loss from livestock production, as it is the main source of ammonia emissions in the Baltic Sea Region (BSR). There is a distinct need to reduce ammonia emissions as they are increasing in most of the BSR countries. The EU has also introduced stricter emission targets. Slurry Acidification Technologies (SATs) can be an answer for required reductions as acidification of slurry decreases ammonia emissions and increases yields. An analysis of the market potential for SATs in the BSR shows the theoretical potential to process slurry is over 240 million tons. At the country level an estimated share of liquid manure feasible for SATs varies between 30 % to 85 %. Denmark currently has 20 % of the slurry being acidified but there is still a huge potential to increase the implementation of SATs. The project has released a report “Possibilities and bottlenecks on implementing slurry acidification techniques in the Baltic Sea Region” which will give more detailed picture of the situation of implementation of SATs in the region. Sulfuric acid is used for the acidification process in all three SATs and thus safety and health issues has to be considered before implementation. Slurry has strong buffering capacity and thus the project has also been analysing how the pH changes in time with different types of acidified slurry. The project has been conducting field tests during summer 2016 and 2017 and will continue during summer 2018. The main focus of the tests are to quantify the effect slurry acidification has on nitrogen use efficiency (NUE) and yields. The Swedish and German tests from 2016 showed increased NUE and increased yields from slurry acidification, although results were not always statistically significant. Actual ammonia emissions were also measured in German field trials and the results showed strong reduction of ammonia emissions. Results from the 2017 field tests in Finland, Estonia, Poland and Germany have not been compiled and analysed yet, however, in Sweden no yield increase was detected due most likely to the extreme drought conditions during that summer. An initial case-study of the economy of slurry acidification based on Swedish field trials showed the techniques can be profitable during years with normal weather conditions. There will be seven SAT investments done during the lifespan of the project. Two of five in-field technology investments are completed in Sweden and in Latvia, while Germany, Lithuania and Estonia are still in the procurement process. Two in-storage technology investments are planned in Lithuania and Poland. Initial estimates during the planning phase of these investments indicate that up to 48 000 kg nitrogen can be saved annually by the project investments alone. by the German partner Blunk Gmbh, can be read here.